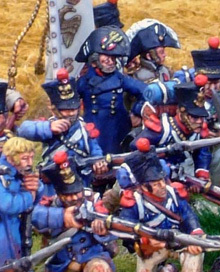 The 1st battalion /1st Tirailleurs of the Young Guard. 24 models mostly Perry metals with some plastics and plastics/metal conversions. I am very pleased with this unit which accurately represents one of the 8 Young Guard battalions which fought around Plancenoit on the 18th. Their size is accurate in terms of R2E scale. 4 bases of 6 models. By mid November Warfare Miniatures will be offering 132 variants on Cuirassiers for the period 1670 - 1721. This is achieved by having 22 sets of 3 unique sculpts available on both Standing or Galloping horse variants. The range covers English, Irish, Dutch, French, German, Danish, Bavarian, Austrian Imperial Circle, early Swedish, Saxon, Spanish and a wide variety of smaller states from the Scanian Wars through Sedgemoor, Ireland, Flanders 1689-1697, Rhineland, Italy, Eastern Wars, Great Northern War, WSS in Flanders, Spain and Germany. English helmets, Continental Helmets, Hats, Tricornes, Bareheads with wigs and without, bandaged too. Cuirasses over coats under coats and front plate only. Musicians with arm variants playing and resting. Lances for standards with attachable finials and cords, arm variants with pistols cocked, firing, swords at rest, up right and extended, officers arms waving hats or tricornes.